This module provides classes, functions and I/O support for working with phylogenetic trees. For more complete documentation, see the Phylogenetics chapter of the Biopython Tutorial and the Bio.Phylo API pages generated from the source code. The Phylo cookbook page has more examples of how to use this module, and the PhyloXML page describes how to attach graphical cues and additional information to a tree. This module is included in Biopython 1.54 and later. If you’re interested in testing newer additions to this code before the next official release, see SourceCode for instructions on getting a copy of the development branch. The I/O and tree-manipulation functionality will work without them; they’re imported on demand when the functions draw(), draw_graphviz() and to_networkx() are called. The Phylo module has also been successfully tested on Jython 2.5.1, minus the Graphviz- and NetworkX-based functions. However, parsing phyloXML files is noticeably slower because Jython uses a different version of the underlying XML parsing library. Like SeqIO and AlignIO, this module provides four I/O functions: parse(), read(), write() and convert(). Each function accepts either a file name or an open file handle, so data can be also loaded from compressed files, StringIO objects, and so on. If the file name is passed as a string, the file is automatically closed when the function finishes; otherwise, you’re responsible for closing the handle yourself. See the PhyloXML page for more examples of using tree objects. Incrementally parse each tree in the given file or handle, returning an iterator of Tree objects (i.e. some subclass of the Bio.Phylo.BaseTree Tree class, depending on the file format). example from Prof. Joe Felsenstein's book "Inferring Phylogenies"
same example, with support of type "bootstrap"
If there’s only one tree, then the next() method on the resulting generator will return it. Note that this doesn’t immediately reveal whether there are any remaining trees – if you want to verify that, use read() instead. Parse and return exactly one tree from the given file or handle. If the file contains zero or multiple trees, a ValueError is raised. This is useful if you know a file contains just one tree, to load that tree object directly rather than through parse() and next(), and as a safety check to ensure the input file does in fact contain exactly one phylogenetic tree at the top level. treedata = "(A, (B, C), (D, E))"
The other I/O functions also can be used with StringIO. (General tip: if you write to the StringIO object and want to re-read the contents, you’ll need to call the seek(0) method to move the handle back to the start of the StringIO data – the same as an open file handle. See examples of this in the unit tests for Phylo in the Biopython source code. Write a sequence of Tree objects to the given file or handle. Passing a single Tree object instead of a list or iterable will also work (see, Phylo is friendly). Given two files (or handles) and two formats, both supported by Bio.Phylo, convert the first file from the first format to the second format, writing the output to the second file. Within the Phylo module are parsers and writers for specific file formats, conforming to the basic top-level API and sometimes adding additional features. PhyloXMLIO: Support for the phyloXML format. See the PhyloXML page for details. NeXMLIO: Support for the NeXML format. NewickIO: A port of the parser in Bio.Nexus.Trees to support the Newick (a.k.a. New Hampshire) format through the Phylo API. NexusIO: Wrappers around Bio.Nexus to support the Nexus tree format. CDAOIO: Support for the Comparative Data Analysis Ontology (CDAO). Requires RDFlib. The Nexus format actually contains several sub-formats for different kinds of data; to represent trees, Nexus provides a block containing some metadata and one or more Newick trees (another kind of Nexus block can represent alignments; this is handled in AlignIO. So to parse a complete Nexus file with all block types handled, use Bio.Nexus directly, and to extract just the trees, use Bio.Phylo. The basic objects are defined in Bio.Phylo.BaseTree. To support additional information stored in specific file formats, sub-modules within Tree offer additional classes that inherit from BaseTree classes. Each sub-class of BaseTree.Tree or Node has a class method to promote an object from the basic type to the format-specific one. These sub-class objects can generally be treated as instances of the basic type without any explicit conversion. PhyloXML: Support for the phyloXML format. See the PhyloXML page for details. Newick: The Newick module provides minor enhancements to the BaseTree classes, plus several shims for compatibility with the existing Bio.Nexus module. The API for this module is under development and should not be relied on, other than the functionality already provided by BaseTree. Some additional tools are located in the Utils module under Bio.Phylo. These functions are also loaded to the top level of the Phylo module on import for easy access. Where a third-party package is required, that package is imported when the function itself is called, so these dependencies are not necessary to install or use the rest of the Tree module. str(tree) produces a plain-text representation of the entire tree. Strings are automatically truncated to ensure reasonable display. Phylogeny(description='phyloXML allows to use either a "branch_length"
draw() displays a rooted phylogram using Matplotlib or Pylab. New in Biopython 1.58.
draw_graphviz mimics the networkx function of the same name, with some tweaks to improve the display of the graph. If a file name is given, the graph is drawn directly to that file, and options such as image format (default PDF) may be used. Sadly the plot draw_graphviz draws is misleading, so we have deprecated this method. The branch lengths are ignored and the distances between nodes in the plot is arbitrary, per the graphviz layout engine. 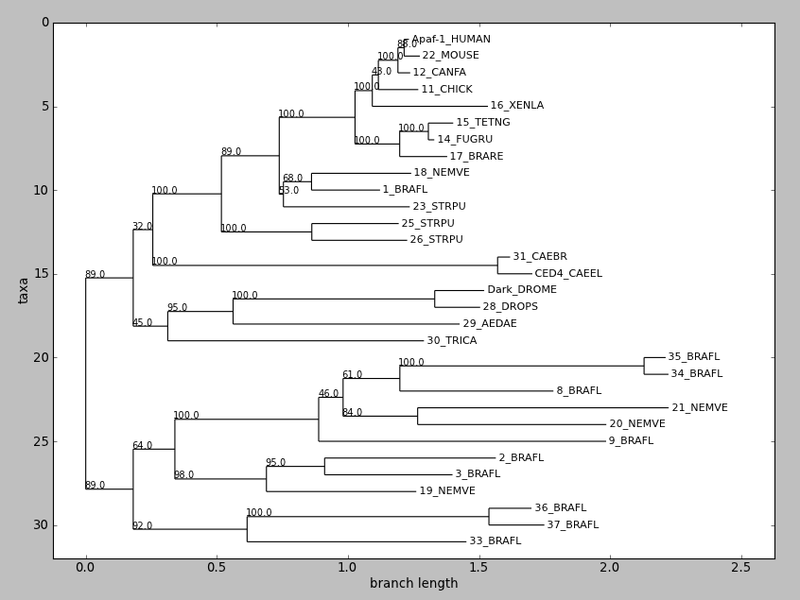 But it looks like a proper radial phylogeny at first glance, which could lead to a wrong interpretation of the data. It would be better for users to create radial plots with another library like ETE or DendroPy, or just use the simple rectangular plot produced by Phylo.draw. Prerequisites: In addition to NetworkX, you’ll need a local installation of Graphviz, Matplotlib and either PyGraphviz or pydot. See the Phylo cookbook page for more drawing features and options. draw_ascii prints an ascii-art rooted phylogram to standard output, or another file handle if specified. Only terminal node labels are shown; these are the result of str(clade) (usually clade names). The width of the text field used for drawing is 80 characters by default, adjustable with the column_width keyword argument, and the height in character rows is twice the number of terminals in the tree. Although any phylogenetic tree can reasonably be represented by a directed acyclic graph, the Phylo module does not attempt to provide a generally usable graph library – only the minimum functionality to represent phylogenetic trees. Instead, it provides functions for exporting Tree objects to the standard graph representations, adjacency list (dict) and adjacency matrix, using third-party libraries. 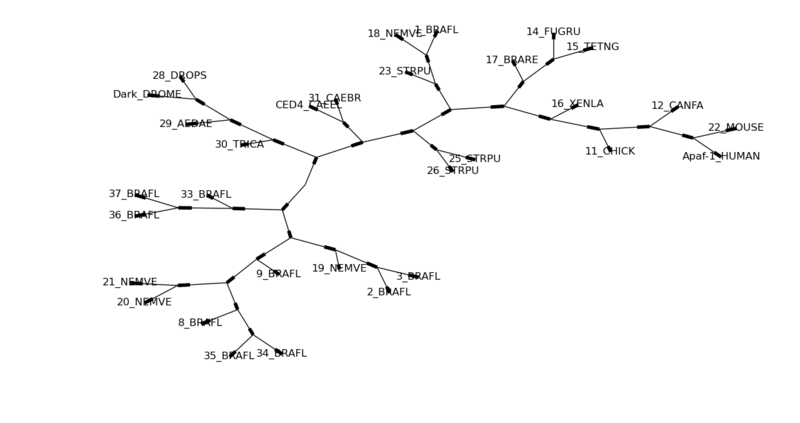 to_networkx returns the given tree as a NetworkX LabeledDiGraph or LabeledGraph object (depending on whether the tree is rooted). You’ll probably need to import NetworkX directly for subsequent operations on the graph object. From this point you can also try using one of NetworkX’s drawing functions to display the tree, and for simple, fully labeled trees it may even work – but you’ll have better results with Phylo’s own draw_graphviz function, discussed above. Recipes for exporting to other libraries, including ape (via Rpy2) and PyCogent, are available on the Phylo cookbook page. Many new features for building and processing phylogenetic trees were developed by Yanbo Ye for Google Summer of Code 2013. They are available on the development branch (see SourceCode) but are not yet included in an official Biopython release version. Note that the behavior and API of these features may change before the upcoming official release. In addition to wrappers of tree construction programs (PHYLIP programs through EMBOSS wrappers in Bio.Emboss.Applications), now Biopython also provides several tree construction algorithm implementations in pure python in the Bio.Phylo.TreeConstruction module. All algorithms are designed as worker subclasses of a base class TreeConstructor. All constructors have the same method build_tree that accept a MultipleSeqAlignment object to construct the tree. Currently there are two types of tree constructors: DistanceTreeConstructor and ParsimonyTreeConstructor. The DistanceTreeConstructor has two algorithms: UPGMA (Unweighted Pair Group Method with Arithmetic Mean) and NJ (Neighbor Joining). As you see, we create a DistanceCalculator object with a string ‘identity’, which is the name of the model (scoring matrix) to calculate the distance. The ‘identity’ model is the default one and can be used both for DNA and protein sequences. To check available models for DNA, protein or all, use the attribute of the calculator dna_models, protein_models, models respectively. After the calculator is created with the model, simply use the get_distance() method to get the distance matrix of a given alignment object. Then you will get a DistanceMatrix object, a subclass of Matrix(we will talk about this later). Now, let’s get back to the DistanceTreeConstructor. We can pass the DistanceCalculator object and a string parameter(‘nj’ or ‘upgma’) to initialize it, and then call its build_tree() as mentioned before. While sometimes you might want to use your own DistanceMatrix directly instead of the raw alignment, we provide another direct way to use both algorithms. The ParsimonyScorer is a combination of the Fitch algorithm and Sankoff algorithm. It will work as Fitch algorithm by default if no parameter is provide, and work as Sankoff algorithm if a parsimony scoring matrix (a Matrix object) is given. Then the scorer is passed to a TreeSearcher to tell it how to evaluate different trees during searching. Currently, only one searcher NNITreeSearcher, the Nearest Neighbor Interchange (NNI) algorithm, is implemented. By passing the searcher and a starting tree to the ParsimonyTreeConstructor, we finally get the instance of it. If no starting tree is provided, a simple upgma tree will be created instead, with the ‘identity’ model. To use this parsimony constructor, just simply call the build_tree method with an alignment. Same as tree construction algorithms, three consensus tree algorithms(Strict, Majority Rule and Adam Consensus) in pure python are also implemented in the Bio.Phylo.Consensus module. You can directly call strict_consensus, majority_consensus and adam_consensus to use these algorithms with a list of trees as the input. Instead of using 50% as the cutoff, the majority_consensus method allows you to set your own one by providing an extra cutoff parameter(0~1, 0 by default). That means it can also work as strict consensus algorithm when the cutoff equals 1. One more thing different to strict and adam consensus tree, the result majority rule consensus tree has branch support value that are automatically assigned during calculation. To get the consensus tree, we must construct a list of bootstrap replicate trees. So in the Bio.Phylo.Consensus module, we also provide several useful bootstrap methods to achieve this. As you see, the bootstrap method accepts a MultipleSeqAlignment object and generates its bootstrap replicate 100 times. The you can use them to build replicate trees. While, we also provide a convenient method to do this. This time we pass an extra DistanceTreeConstructor object to a bootstrap_trees method and finally got the replicate trees. Note that both bootstrap and bootstrap_trees are generator functions. You need to use list() function to turn the result into a list of alignment or trees. Another useful function is bootstrap_consensus. By passing the consensus method as another extra parameter, we can directly get the consensus tree. To get the branch support of a specific tree, we can use the get_support method. In the above code, we use the first tree as the target tree that we want to calculate its branch support. The get_support method accepts the target tree and a list of trees, and returns a tree, with all internal clades assigned with branch support values. There are some other classes in both TreeConstruction and Consensus module that are used in those algorithms. They may not be used commonly, but might be useful to you in some cases. The _Matrix class in the TreeConstruction module is the super class of _DistanceMatrix. They are both actually constructed by a list of names and a nested list of numbers in lower triangular matrix format. The only difference between them is that the diagonal elements in _DistanceMatrix will all be 0 no matter what values are assigned. You can use two indices to get or assign an element in the matrix, and the indices are exchangeable. 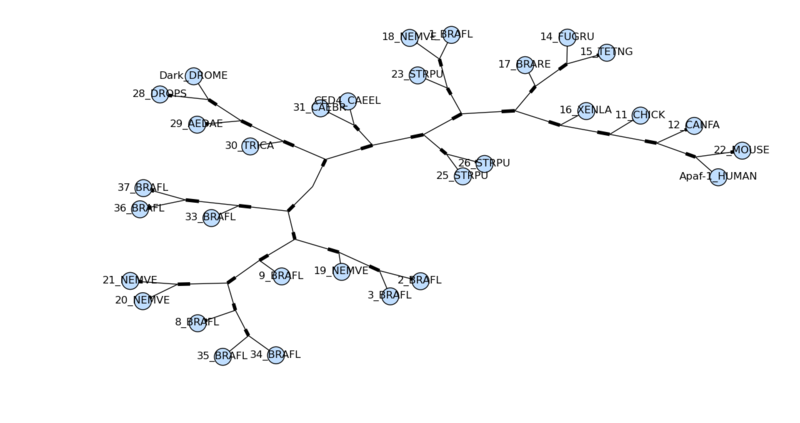 In consensus and branch support algorithms, it is used to count and store the clades in multiple trees. During counting, the clades will be considered the same if their terminals (in terms of name attribute) are the same. For both trees, a _BitString object ‘11111’ will represent their root clade. Each ‘1’ stands for the terminal clade in the list [A, B, C, D, E] (the order might not be the same, it’s determined by the get_terminal method of the first tree provided). For the clade ((A, B), C) in tree1 and (A, (B, C)) in tree2, they both can be represented by ‘11100’. Similarly, ‘11000’ represents clade (A, B) in tree1, ‘01100’ represents clade (B, C) in tree2, and ‘00011’ represents clade (D, E) in both trees. This is how the _BitString is used in the consensus and branch support algorithms. And I think it can be used in many other conditions. For example, we can even use it to check whether the structures of two trees are the same. Bio.Phylo.PhymlCommandline provides a wrapper for PhyML following the usual Bio.Applications API. Bio.Phylo.PAML provides wrappers, parsers and utilities for working with the PAML suite of programs. See the Biopython Tutorial sections on sequence alignment and BLAST for explanations of the first few steps shown here. Search for homologs of a protein sequence using BLAST. Extract the best hits from the BLAST result. To help with annotating to your tree later, pick a lookup key here (e.g. accession number) and build a dictionary mapping that key to any additional data you can glean from the BLAST output, such as taxonomy and GI numbers. In this example, we’re only keeping the original sequence and accession number. Re-align the sequences using Muscle. The program creates an alignment file in Clustal format, “egfr-family.aln”. Add accession numbers and sequences to the tree – now we’re using PhyloXML’s extra features.